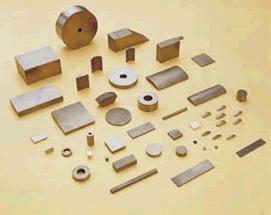 1.SmCo permanent magnet has high magnetic energy product and high coercive force. Its properties are better than Alnico, ferrite permanent magnet. Its max. energy product is up to 239kJ/m3(30MGOe), which is three times of that of AlNiCo8 permanent magnet, eight times of that of ferrite permanent magnet (Y40). So the permanent magnetic component made from SmCo material is small, light and stable in property. It is widely applied to electro acoustic& telecommunication apparatus, electric motors, measure meters, peg-top electronic watch, microwave apparatus, magnetic mechanism, sensor and other static or dynamic magnetic routes. 2.The curie temp. of the SmCo permanent magnet is high and its temp. Coeff. is low. So it is suitable for use at 300, high temp. 4.The main ingredient of SmCo permanent magnet is metal cobalt(CoY99.95%). So its price is high. *Superior resistance to high temperature, Curie temperature of majority is over 800?? *Excellent corrosion resistance capability, no coating is needed for surface protection.